Ask fellow campers about "Midway Campground Resort (formerly Statesville East I-40 Winston-Salem" and nearby attractions. This was our first time at this hidden gem. Great hospitality from the staff in the office and assisting us to the site. The campground was friendly like a neighborhood and the views were peaceful. The concrete patio and furniture was a great add. Highly recommend and we are returning in May. We camped at Midway Campground Resort (formerly Statesville East I-40 Winston-Salem in a Motorhome. Midway campground & RV Resort check in 3pm and check out 1pm. 4 nights @ $44.67 with a military discount. We needed a fill in spot before hitting our next camp ground, and decided on this campground. Thursday thru Sunday stay, so we hit their Halloween celebration that included an open to the public scary walk in the woods with all the sound effects well into the late night Sat and Sun. The roads thru the park are dirt, mud, very large rocks, uneven and hard to rock and roll thru that we have ever experienced. Our original spot was parallel with the dirt road and as you open your front door you are on the dirt road, the picnic table is across the dirt road. The road is well traveled by rigs and vehicles. So changed spots to one that is on a corner that big rigs are trying to get around, one did not make it as our water spigot was flattened in the process, luckily we were not hooked up to the water. A golf cart directs you to your site. After setting up the first day, our neighbor let the dogs loose literally. 2 huge dogs came over and did their jobs and returned to the other camp site, this went on every day several times a day, called and reported 3 times over the 4 night stay, finally gave up. I think they called them as the person was yelling outside about it but continued to let them run off leashes. Lots for kids to do, playground, jumping bag and pool when the season supports. A small pond has a flock of friendly ducks on it that approach you for a snack, fishing allowed. Many permanent and seasonal sites, the rest of us are intermingled. The bathrooms were dirty with a pair of shoes and clothing for 3 nights, but it was a weekend with a lot of people. Bath house door codes did not work as the doors were not locked. cons: highway noise, Rules not enforced with pets, rough roads, some work needs to be put into this park to bring it back up to an acceptable level. pros: lots for kids to do, pond with ducks. Would not return again. Not a lot to do in the area. We camped at Midway Campground Resort (formerly Statesville East I-40 Winston-Salem in a Motorhome. We've stayed here a number of times over the past 10 years. Sometimes overnight passing through, sometimes for a few days, & once for a 4 month stay. Long-standing family owned CG, former KOA now private again. Great activities for kids. Pool, putt-putt, lake / fishing, game room. Small laundry. Some long-timers and many local families come for weekends. Pool also open to local public. Some sites are very shady; some water view. Reliable electric/water/sewer. Bumpy hard-packed gravel roads throughout. Staff is friendly & helpful (despite other reviews you might see - maybe he was having a tough day. True, no excuse, but don't let it keep you away). 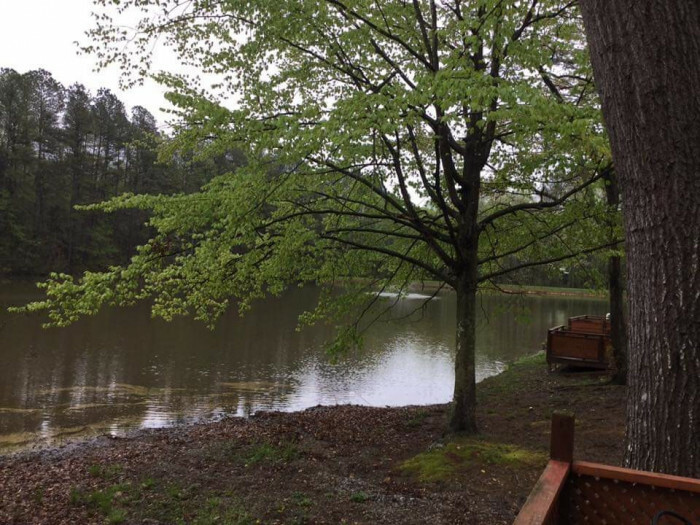 Nice location east of Statesville - which has every chain restaurant you can imagine. Great ice cream in CG store. We keep going back - so would definitely stay here again. We camped at Midway Campground Resort (formerly Statesville East I-40 Winston-Salem in a Travel Trailer. Great mom & pop BBQ spot - Keaton's - very close by. Be sure to ask. First off, this place is not Big Rig friendly. Internal roads are narrow and washed out gravel with major ruts that look like they haven't been attended to in a long time. Lomg term guests park in the roadway making it impossible to pass them until you ask them to move. Management needs to enforce some common sense on what they allow folks to get away with. I will say that the staff was very friendly when checking in. The term "Resort" is a carryover from when it was a KOA in that they have a pool, playground, etc., but it's not what I would consider a resort. I do not know how Good Sam came up with the rating they have on their site, but they obviously haven't been there. Our site was one of a very few that was fairly level. This park has potential and if the roads and sites were attended to it would go a long way towards getting better reviews. 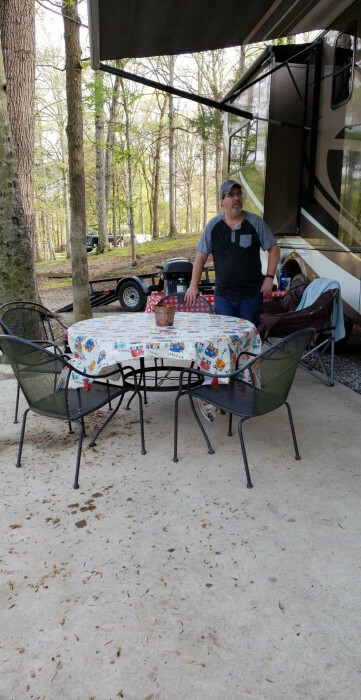 We camped at Midway Campground Resort (formerly Statesville East I-40 Winston-Salem in a Motorhome. What a dump. Washed out roads & ruts. Muddy sites and too close. If you can avoid this place do so. 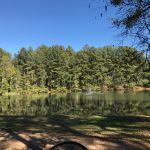 We camped at Midway Campground Resort (formerly Statesville East I-40 Winston-Salem in a Motorhome. Overnight stop convenient to I-40. Mostly shaded and hilly with erosion problems but looks like they are trying hard to keep things up. We were in a freshly graveled fairly level pull thru site below the pool area - easy in and out. Good hook ups and basic cable. WIFI was slow but Verizon signal was good. Could not get a Dish satellite signal. We camped at Midway Campground Resort (formerly Statesville East I-40 Winston-Salem in a Motorhome. Could not level the motorcoach on the lot we were on. The slot was not level. The staff told me that no one had a problem but my neighbor said that was not true. Never offered to move us to a more level slot. We only stayed overnight so was not worth making an issue of it. 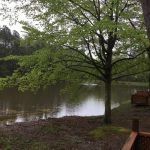 We camped at Midway Campground Resort (formerly Statesville East I-40 Winston-Salem in a Motorhome. We stayed one night on our way north. Campground is built in a very hilly area so roads wind up and down. Sites are gravel and some have patios. Has a huge pool and deck area and mini putt. Office staff is very friendly and extremely helpful. Even delivered a takeout menue right to our site since it was raining. Campground is old and a bit rundown but we'll be back. 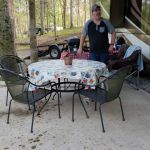 We camped at Midway Campground Resort (formerly Statesville East I-40 Winston-Salem in a Fifth Wheel. If you want decent pizza delivery, try Mivanos Pizza. We had pizza, appetizer sampler and garlic breadsticks. Fast and good. They deliver to office and you pick up there. Easy access on and off I-77 and I-40. The CG was clean and well maintained with a friendly and accommodating staff. I had a pull through with full hookups. We didn't hear the road noise mentioned by others most likely because we were located in the back of the CG. WiFi was the fastest when compared to other CGs we visited. We would stay here again. We camped at Midway Campground Resort (formerly Statesville East I-40 Winston-Salem in a Motorhome. Overall it was a pleasant 2 night stay. Sites are VERY close together. Our site (14) was on a row of long term campers. It was level and shaded but very narrow so no room at all to spread out. The campground is older and dated but quiet and seemed well maintained for the most part. The roads throughout the campground could definitely use some fresh gravel. As well, the gravel at our site was sparse and there were some muddy spots to maneuver around. There are plenty of fun amenities for the kids. We used the pool (nice & big), jumping pillow, game room, fishing pond, playground and basketball court. The reasons I didn't rate above average were because of how close we were to the next camper, how cramped our site was and the condition of the roads. 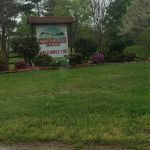 We camped at Midway Campground Resort (formerly Statesville East I-40 Winston-Salem in a Travel Trailer. Gravel interior with a wicked angled speed bump-watch your cabinets-they will fly open!! Large beautiful, spacious and shaded site with lounge chairs and grill. Good cable but WiFi is a bit slow. We stayed one night in a motor home-would stay again. We camped at Midway Campground Resort (formerly Statesville East I-40 Winston-Salem in a Motorhome. This was our first stay at this campground. We go somewhere close by every year on our annual Halloween camping trip and the kid's wanted to go to the campground's Wicked Woods. We decieded to try out this campground since it's no longer a KOA. We got a 50 AMP FHUs pull-thru site # 11. The site was not level and too close to trees to extend our awning. You have to be very careful pulling into the site because of a washed out ditch and the proximity of the cars parked on the road. You will bottom-0ut both your rig if you're not careful. They guide you to your site which was a good thing because they did not take the main gravel road to get to our site like I would have. The road has a very sharp turn and very difficult to make that turn with a longer rig. You have to drive across the grassy area at an angle to make the turn. You have to be very carefully pulling out because it has a sharp turn getting out of this site with a large ditch on the right-hand side and a guide wire for a power pole and a large tree on the left. The activities on Saturday consisted of a small costume contest at 2PM followed by trick-or-treat at 3PM. The main focus for the campground is the Wicked Woods since it's a huge draw for the general public. If you stay at the campground, you can show your receipt and you get a discount for everyone in your party to enter the Wicked Woods. That was very expensive for a family of 4 ( $62 ) but it was fun and my young kids enjoyed it. The pond has a fountain in the middle with catch and release fishing. The sites facing the pond have concrete patio pads but most of them are not suitable for rigs 27 foot or longer. There's a lot of permanent sites where the larger rigs would go. The campground was very easy to find and directly off I-40 at exit 162 ( HWY 64 ) and then immediately take the next left at the Shell station. With that proximity to I-40 comes road noise but it's not too bad. We camped at Midway Campground Resort (formerly Statesville East I-40 Winston-Salem in a Travel Trailer. I would not stay here again. The sites are terrible in regards to level, which they are not, the roads are narrow and are difficult to navigate a big rig, as the turns are sharp with ditches on the outside of the turns. Yeah, it has a beautiful pool, and nice patios at the sites (if and when you can get in or out of the site), cable TV is nice, but this is an old campground that needs some work and thought given to today's motorhomes and the requirement for turning, i.e. tail swing with trees on either side. We just stopped for the night and though convenient from I-40, watch out for the turn off the highway onto the side road, WOW what a ride. Not worth the coin. We camped at Midway Campground Resort (formerly Statesville East I-40 Winston-Salem in a Motorhome. This park is easy to find from the interstate. Interior roads are gravel and a little narrow. We were led to our site. The tree over our coach needed trimming. Sites are gravel, narrow and not really level. We were able to position the coach so we didn't need leveling blocks. There was a paved patio with table, chairs and grill, however, there was so much bird droppings that we wouldn't have used it if we had stayed longer. It rained the night before we left and put some fairly deep ruts in the road. The owners were doing a lot of yard work while we were there, hopefully, they will take care of the dirty patio and the ruts in the interior roads. We might stay here again and give it another try if passing through. It has a lot of possibilities. We camped at Midway Campground Resort (formerly Statesville East I-40 Winston-Salem in a Motorhome. We were pleasantly surprised after reading the poor reviews. Staff were very nice and friendly. They were able to accommodate our 40' with toad easily and had a great pull through place. Nice patio furniture and a big fire pit. Due to time of year we didn't use the outdoor facilities but the park was a great find for us on our way south. Other park was unable to accommodate us with our size. We camped at Midway Campground Resort (formerly Statesville East I-40 Winston-Salem in a Motorhome. 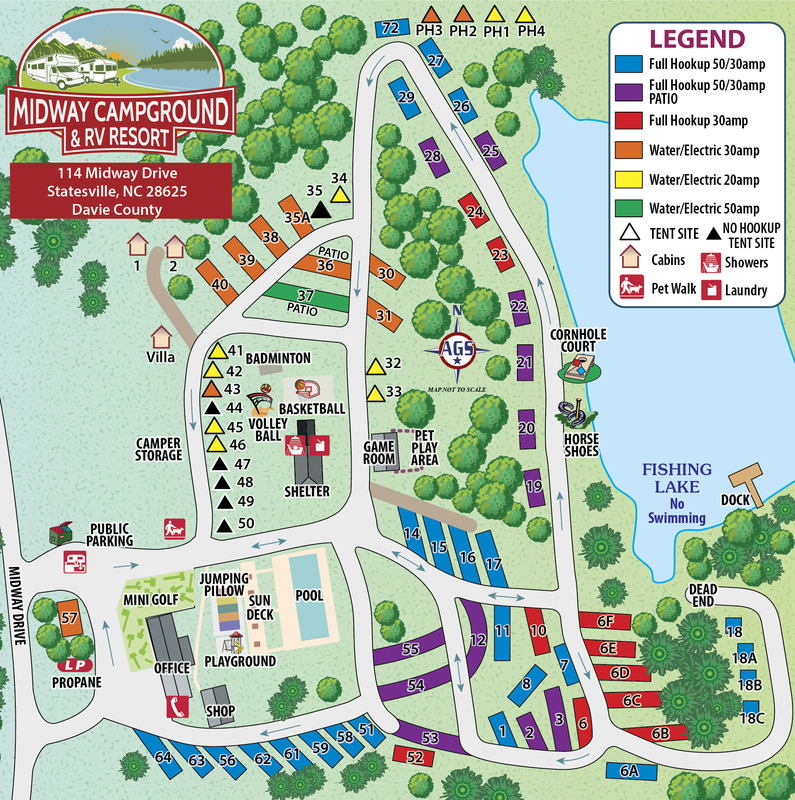 Are you affiliated with Midway Campground Resort (formerly Statesville East I-40 Winston-Salem ?